Please add the ability to change the default texts (i.e. "This field is required.") using the editor. I want to write my own text using a different language. You will need to use the downloaded source code to be able to change those. Change it from there and then upload all files to your web site. I am aware that this option is available, but I would like to see it implemented within the editor itself, so i wont need to download the code. Thanks for your feedback. Added this to our feature requests list. Yes! That function would be very useful. I am using JotForm with Xara Web design and after creating a website, I have to export it so that I can upload it to my server. Now I want to know where do I have to upload the changed files (with translations) of the JotForm? You cannot upload a changed form back to JotForm. You can only get form code from JotForm. It is not possible to upload a changed code back to JotForm. Maybe my question was misunderstood. I downloaded the ZIP file from JotForm, translated the text and now I don't know how to upload these files so that they would work with JotForm on my website. The website is created with Xara Web designer and all the files are written in HTML. One of the pages has a contact us form from JotForm and I inserted it into the page with copy/paste of the source code. Now how to make the changed JS files work with my website? You will replace the form code on your site with them. 2. Delete the JotForm code you have on the site and instead add the HTML code probided on the form HTML file. Please note that there's no longer any need to download the source code to change that message. 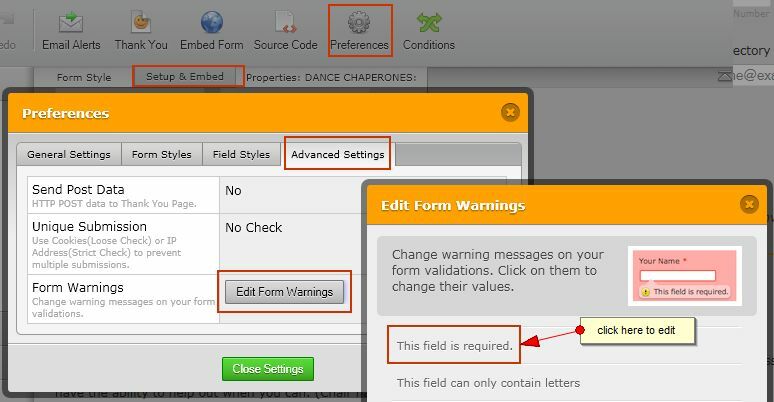 It can now be edited via the Edit Form Warnings button on the Advanced Settings tab of the Preferences (Setup & Embed tab). To further elaborate wayne's solution, I've attached illustrations below and hope this helps.